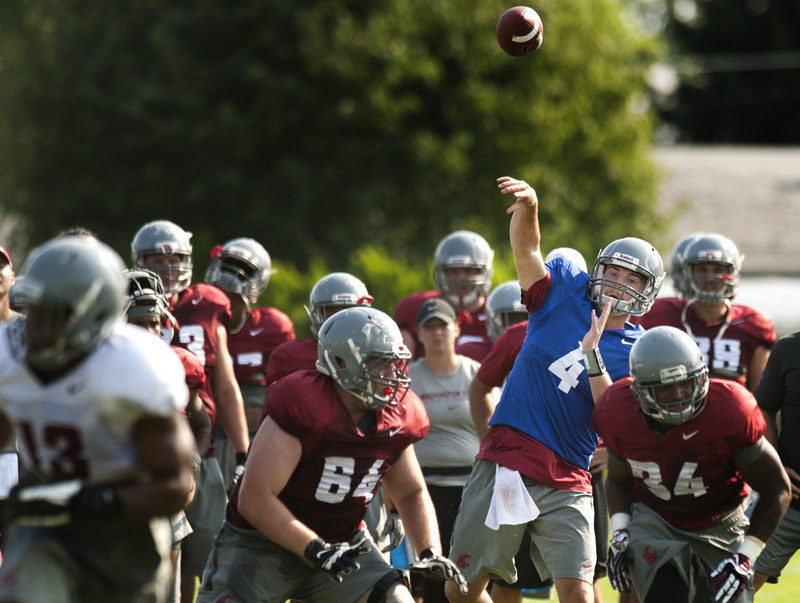 LEWISTON – Despite his youth, redshirt freshman quarterback Luke Falk has more varied college football experiences than a Heisman Trophy winner. He’s been a prep star with a scholarship offer to Florida State and an overlooked senior whose only choices were to pay his own way to college or take the excellent education and athletic anonymity of an Ivy League school. He walked on at WSU as the undercard in his own recruiting class, the fourth man on the depth chart if he was on it at all. Just one year later he’s the next man up if starter Connor Halliday can’t play. Falk’s “strange path” in the words of coach Mike Leach stems from his lost junior season of high school. After receiving the scholarship offer from FSU, Falk transferred from his high school in Logan, Utah, to Oaks Christian High, in California, a school that had never had a starting quarterback that failed to make it to a Division I college. “I kind of thought offers would just roll in after that,” Falk said. They didn’t. The move was hard on Falk and his family, and after just three games the Falks returned to Logan, without the college recruiters in tow. Falk missed the rest of his junior season because of Utah’s transfer rule. It was Bruggman who ran the scout team offense while the two quarterbacks redshirted, and his reputation and polished game led many to believe that he would succeed Connor Halliday as Leach’s man under center. But the 6-foot-4 Falk looked the part, too, and there didn’t seem to be much separating the two besides the cost of their education. When backup quarterback Austin Apodaca transferred spring ball became a contest to see who would enter fall No. 2 on the depth chart behind Halliday, and if anyone won it was Falk. Maybe he didn’t have as tight a spiral as Bruggman, or as strong an arm, but Falk could stare down a pass rusher before dumping off a screen pass at the perfect moment, and he could follow a bad play with a good one as if the bad never happened. “He’s very relaxed,” Leach said. “One of his biggest strengths probably, and really of anybody I’ve dealt with, is that regardless of the previous play, a great play or a bad play, he’s very calm. He’s very calm and has the ability to focus on the play itself regardless of the situation or what happened before.” This offseason was a war of attrition at the quarterback spot and Falk won when Bruggman announced that he too would transfer. The walk-on, who Leach says will be on scholarship soon, has settled into the backup role, taking as many reps as Halliday in the 11-on-11 team sessions. He also garners more respect in the huddle, now that he’s no longer the fourth man up. “He’s become a very good leader,” receiver Dom Williams says. “When he gets in he runs the offense. That’s what he’s most improved in by far.” During Wednesday’s practice Falk had the second-string offense at the goal line, with the score tied and up-downs at stake. After a quick strike to River Cracraft to give his team a one-point lead in the drill, Falk threw a veteran touchdown strike to Isaiah Myers, throwing the ball out of reach of the defense and toward the ground, where only Myers could catch it. Just a year after giving up an Ivy League education for the dream of playing Pac-12 football, Falk is nearly certain to see action this year. And if he were to someday start, it would hardly be the strangest thing to happen in his career.